One of the most iconic instruments in rock and roll history is Paul McCartney's Hofner violin bass guitar. Not quite as recognizable, but equally important is McCartney's 'other' bass, his Rickenbacker 4001 bass guitar. The Rickenbacker was first presented to McCartney on the Beatles introductory American tour in 1964 due to the fact that both Lennon and Harrison obviously used Rickenbacker guitars on stage. McCartney originally showed no interest in the instrument, possibly because of the dependability of his trusty Hofner and also rumored to the fact that no one at Rickenbacker took the time to notice that Macca was a left handed player. Later, during the Beatles performance at the Hollywood Bowl in August of 1964, McCartney was presented a left handed model, its construction started in January of 1964. The instrument would stay silent until the year 1965 when McCartney got to spend some proper time exploring its features. In contrast to his Hofner bass, the Rickenbacker was a larger and heaver bass guitar. It's solid body weighed in at ten pounds and its maple and rosewood neck at 33 1/4" was much longer that the Hofner at 30". The longer through body neck and solid form gave the Rickenbacker a deeper more elastic tone and a more complex resonance than the Hofner, which according to McCartney also had a hard time staying in tune. The bass was fitted with a pair of robust 'toaster top' pick ups, one covered with a large chrome hand rest.When McCartney received the instrument it was decorated in a sharp 'fireglo' finish and featured two regal horns that protruded from the top and bottom of the instrument, in addition to volume and tone knobs for each of the pick ups respectively. As the Beatles touring days came to a conclusion and their radical studio explorations drew closer, the Rickenbacker became McCartney's go to instrument for his increasingly revolutionary melodic approaches. The switch to this aforementioned instrument coincided with McCartney's discovery of the magic of counter melodies and a new guitar players approach to the instrument. These factors should be taken into account with McCartney's new found experimentation with the avant garde as well as with drugs, as this new bass provided the perfect platform for the Beatles arising musical directions beginning in 1965. While not definitive, it has been reported that the Rickenbacker was used on the Rubber Soul track 'Think For Yourself' (By George) as well as the 1965 single 'Day Tripper'. It sounds like it. There is also documentation that the bass was in the studio for these sessions. 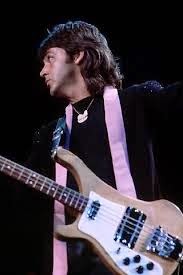 Following the sessions and moving forward, McCartney took the bass along as a back up instrument on the Beatles final US tour in 1966, while it never did appear on stage. What is interesting about this era of McCartney's bass playing is that his evolution and development as a player coincided perfectly with his slow defection from the Hofner to the 'Ric'. It is the 'rock room's' opinion that the instrument allowed McCartney a new freedom on bass, as well as a new sonic approach that the forward thinking McCartney was constantly searching for. It was the perfect instrument for the right time. 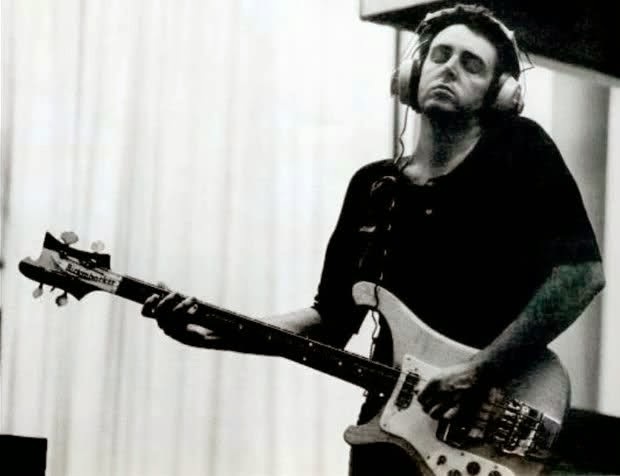 As an aside, it has also been recorded that Macca was working with a capo while experimenting with sounds on the bass during this time period (see pic below). The next definitive sonic appearance of the Rickenbacker 4001 was on the Beatles 1966 single 'Paperback Writer' B/W' Rain'. The fat and taught tone of the instrument is easily recognizable taken in contrast to the usual soft tone of the hollow bodied Hofner. McCartney's approach is that of a lead instrument, the bass lines slither colorfully underneath the Beatles blossoming musical horizon. The band now sounded different and McCartney's new instrument was on of the factors contributing to this eventuality. The Beatles experimentation with compression, echo, overdubbing as well as their willingness to leave the usual recording tactics behind on the record Revolver also contributed to the current flavor of the shifting instrumental attack. 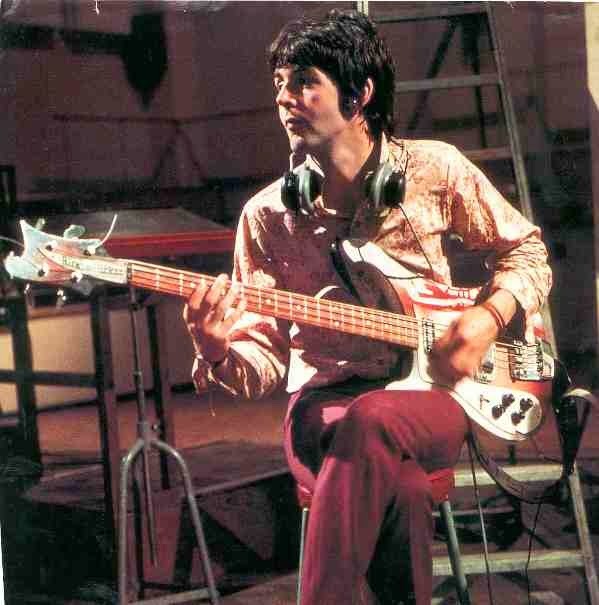 The 4001 bass was now a permanent fixture in McCartney's arsenal. In 1967 the Rickenbacker locked down the bottom end on the Sgt Pepper's Lonely Hearts Club Band LP as well as featuring the Beatles singles during this era. 'Penny Lane' and 'Lovely Rita' are fine examples of the timbre of this instrument in action, as well as McCartney's multifaceted and influential approach. The bass got a facelift in 1967 when Paul had it psychedelically painted in addition to a few of the other Beatles instruments undertaking this change. A nice representation of the 4001 on video with its acquired paint job is on the available 'All You Need Is Love' broadcast footage, the 'Hello Goodbye' music video and the 'I Am the Walrus' performance from the Magical Mystery Tour film. 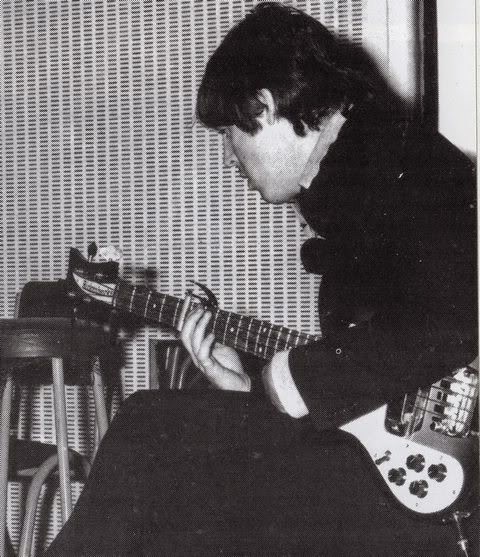 The bass would remain in high use throughout the White Album, noticeable to these ears on 'Dear Prudence', and remain available until the Beatles ended their working relationship in 1970. 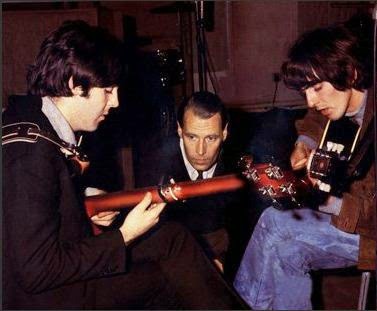 During this time, Paul would play the 'Ric', return to the Hofner while also using a Fender jazz bass. The 'Ric' was eventually stripped back to its original wood, removing the psychedelic luster and returning the instrument to its natural state. Post-beatles it would figure heavily in the multitude of buoyant bass lines comprising the 1970 solo LP McCartney, the 1971 album Ram and the 1973 'Wings' album, Red Rose Speedway. While never becoming his 'main' instrument, it appears that when ever McCartney required a hearty tone with a chunky and cutting attack he would return to the 'Ric'. The 4001 slowly became identifiable with McCartney, as it did become his preferred on stage bass. By 1975 the bass was tailor made for the arena era band, the instrument sliced through smoky concert air and offered a heavy footed thump to larger venues. 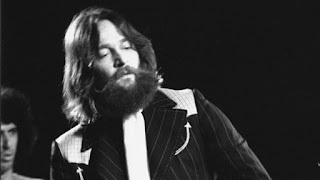 On the video included below the bass flexes its aural muscle with the band on the 1976 tour. McCartney was distancing himself from his 'Beatles' past with 'Wings' and no longer used the Hofner on stage. It was only during his late 1980's touring renaissance would McCartney return to using the Hofner full time. Instead, during the 70's he used the 'Ric', outfitted with a Red Rose Speedway sticker at one point and easily recognizable on the existing footage from these tours for its clarion call and sleek design. McCartney's Rickenbacker 4001 bass is still working today, Giles Martin, producer on McCartney's 2013 album New revealed that the bass was used during the making of the LP on one track. The 'rock room' has not been able to confirm or deny this track as of yet. The bass has been McCartney's trusted companion for 50 years, never completely replacing the iconic Hofner in the eyes of fans, but always on a rack waiting for its moment to sing. Rickenbacker's have a discernible sound popularized in the 60's and still disseminated today. Combining this sound with the artistic prowess and revolutionary thinking of Paul McCartney equatedto the documented musical success. From its beginnings and creation in the ambiance of creativity of the 1960's, McCartney's Rickenbacker bass has now become inseparable from McCartney himself in the annals of rock history.